The Rising Storm’s ultra-rare debut album. For more than 200 years, the students of Phillips Academy Andover have been the children of privilege. But if you were a teenager infatuated with rock ’n’ roll in the mid-1960s, your privileges on the prep school campus were sometimes revoked. An unruly haircut, for instance, might get you barred from the dining hall. “The music director at Andover hated rock ’n’ roll,” recalls Richard Weinberg, who played electric guitar. “It was the end of the universe for this guy.” So Weinberg and his bandmates were forced into some errant behavior, sneaking through unlocked windows with their gear to practice in the music building. They’re much older now, and wiser. Last June, the six distinguished members of the Rising Storm were invited back to the Andover dining hall, where they played for their 50th class reunion. As adults, they’d become lawyers and professors and newspaper editors. Every so often, though, they revisit their rock ’n’ roll salad days. 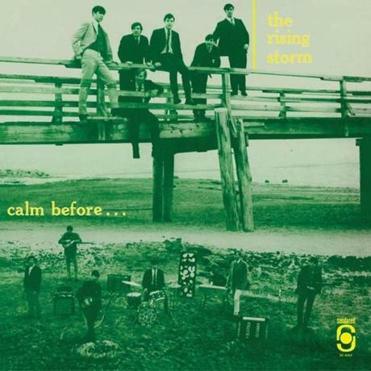 On Friday, the specialty label Sundazed reissues “Calm Before,” the Rising Storm’s self-financed, ultra-rare debut album, recorded during the bandmates’ senior year at Andover and sold for $3 a copy to friends and family. It’s part of a flurry of Boston nostalgia from the label that includes a previously unreleased 1969 live set from the Remains, recorded at the Boston Tea Party, and a new edition of the debut album by the psychedelic oddity Ultimate Spinach. It’s also the latest in a long series of serendipitous revivals for the Rising Storm, who never intended to stay together as a group after high school. But that’s just what has happened, beginning in the 1980s, when the band members first became aware of the fact that their album had become an unlikely collector’s item. They reunited at Andover to make a live record and cut new music for Erik Lindgren’s Arf! Arf! Records. For a while, there was serious talk of a feature film based on their story. Now — years later, and with interest renewed once again in their youthful recordings — there’s a documentary film ready for release. The Rising Storm grew out of an impromptu jug band of Andover sophomores, soon teaching each other the guitar licks they taught themselves. (Keyboardist Charlie Rockwell was the only one who’d taken music lessons.) Though they were too young to get off campus much, they were drawn to local bands from Boston’s first real rock ’n’ roll wave. They worshiped the Remains, who were a house band of sorts at the first incarnation of the Rat, and they covered two songs on “Calm Before” by another Boston band, the Rockin’ Ramrods. But it was the Rising Storm’s handful of dreamlike, sensitive-boy originals, largely inspired by the fantastical West Coast band Love, that set the group apart. Until the first reunion, Thompson had no idea they were considered part of the so-called “garage” band movement that followed the British Invasion. (The Remains, among the best of the bunch, famously opened for the Beatles on tour in 1966.) He wasn’t even aware of the category. He thought it was a typo: “garbage” music. Though the Rising Storm’s music hinted at the coming experimentalism in rock, the band members had hung up their rock ’n’ roll loafers by the time producer Alan Lorber came up with his short-lived marketing concept for MGM Records — the “Bosstown Sound.” While Orpheus, Ultimate Spinach, and a few other bands were making a gallant effort to steal a little of San Francisco’s psychedelic thunder, the Storm had abated. These days, the members of the Rising Storm relish their remaining chances to get the band back together, as they hope to do when the documentary debuts. Thompson, now retired after a law career in Washington, D.C., is moving full time into the home he built in southern Maine. Rockwell, a retired National Guard colonel, is a flight and ski instructor in Vermont. Bassist Todd Cohen, a longtime newspaperman, advises nonprofits in North Carolina. And drummer Tom Scheft, like Weinberg, is a college professor in North Carolina. Though they’ve scattered, “these guys are still my closest friends on Earth,” says Cohan. “Most bands don’t stick together as long as we have,” says Thompson. “We’re all thrilled with it. It’s given us the opportunity to maintain our relationships. We know each other inside and out. All the positives and negatives are known to each of us. An earlier version included an incorrect photo that did not depict the Rising Storm.